The final post for the year ends with the final challenge from the mighty Daring Bakers. If you've been seeing something like 400 plus Yule Logs all over the blog world, let me just say you have not lost it in anyway and the whole world has not turned Christmas crazed! It was just us Daring Bakers taking the latest challenge, set out by none other than the two founding members, Ivonne and Lis head on. They decided to make this a fantastic Christmas challenge by picking out a Yule Log for all of us to take on. This time I had fantastic company for the challenge, with a fellow Daring Baker. Saffron: ok, is it time for the verdict? do we fill this log? 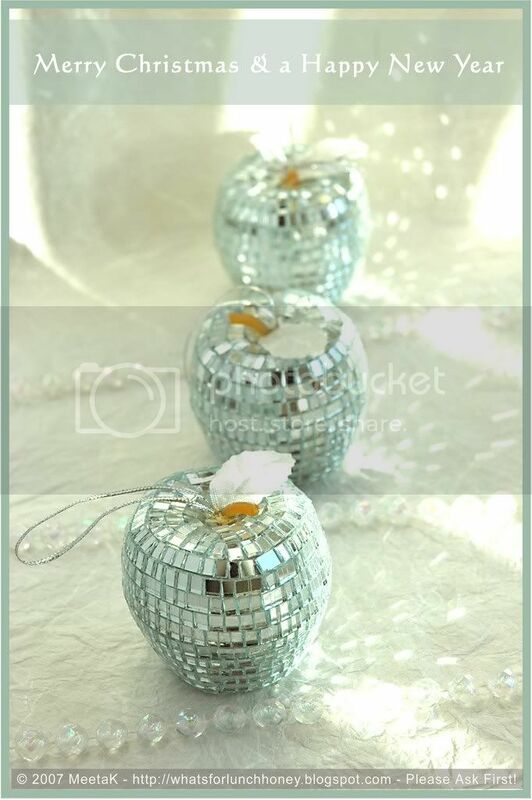 have you tasted the pears with the cream? Meeta: and then the tasting galore from the cake should we make a cheese sandwich? Yup we even managed to make a cheese sandwich in between the challenge! According to the challenge we were allowed to modify the flavoring of the buttercream and both Hilda and I decided to go for chocolate and pears. The details for this challenge were simple enough to follow. I did freak a little because I do not ever remember making a genoise buttercream roll that did not rip. This, unfortunately, was no exception. But in the end we both decided that our logs had character and under that note I present you with the Yule Log with character! A coffee buttercream frosting using the recipe below. For those that have an aversion to coffee, we were allowed to use another flavour for the buttercream, however, the buttercream must be dark in colour. No white or cream-coloured Yule Logs! The genoise was to be made using the recipe provided; however, we were allowed to flavor it however we wished to. While the outside of the Yule Log was to be frosted with the buttercream using the recipe provided here, we were free to fill the recipe however we choose. Fill it with fruit, jam, melted chocolate, pudding, whipped cream, or another frosting of our choice. We were to decorate our log with mushrooms. We had the choice of wither meringue or marzipan mushrooms. We also had the complete freedom, besides the mushrooms, to decorate the logs however we wished. High altitude modifications were allowed as long as we stayed "true" to the recipe. Conversion for certain dietary restrictions like gluten-free, dairy-free, vegan etc. was allowed. Recipe ingredient exception allowed only if allergy or an ingredient not available or cost prohibitive in our region. While Hilda went for meringue mushrooms, I decided to go for marzipan mushrooms as the thought of dealing with genoise, buttercream and meringue was too much for me. Besides I thought it would be therapeutic to form marzipan mushrooms after all the hard work on the rest of the cake. The recipes below are for the original genoise, the chocolate buttercream with pears and marzipan mushrooms. You'll find Hilda's Yule log here and the Yule logs of all the other Daring Bakers here. Drop In & Decorate with freshly baked cookies and treats. Hope you will join me baking for a good cause. Look forward to having you all over. ½ cup cake flour - spoon flour into dry-measure cup and level off. I used all-purpose flour as I was unable to get cake flour. one 10 x 15 inch jelly-roll pan that has been buttered and lined with parchment paper and then buttered again. Here I used my normal baking sheet to make the genoise as I do not have a jelly pan. Set a rack in the middle of the oven and preheat to 200 degrees C.
Half-fill a medium saucepan with water and bring it to a boil over high heat. Lower the heat so the water is simmering. Whisk the eggs, egg yolks, salt and sugar together in the bowl of a heavy-duty mixer. Place over the pan of simmering water and whisk gently until the mixture is just lukewarm. Test with your finger - it should be warm to the touch. Attach the bowl to the mixer and, with the whisk attachment, whip on medium-high speed until the egg mixture is cooled (touch the outside of the bowl to tell) and tripled in volume. The egg foam will be thick and will form a slowly dissolving ribbon falling back onto the bowl of whipped eggs when the whisk is lifted. While the eggs are whipping, stir together the flour and cornstarch. Sift one-third of the flour mixture over the beaten eggs. Use a rubber spatula to fold in the flour mixture, making sure to scrape all the way to the bottom of the bowl on every pass through the batter to prevent the flour mixture from accumulating there and making lumps. Repeat with another third of the flour mixture and finally with the remainder. Scrape the batter into the prepared pan and smooth the top. Bake the genoise for about 10 to 12 minutes. Make sure the cake does not overbake and become too dry or it will not roll properly. While the cake is baking, begin making the buttercream. Once the cake is done (a tester will come out clean and if you press the cake lightly it will spring back), remove it from the oven. Humidify a tea towel and tip the genoise on to it. Place a sheet of waxed paper on top and using the tea towel to help, gently roll the genoise. Allow to cool like this. This helps the genoise to roll a little more easily when it has been filled with the buttercream. 200g pears in syrup - chopped. I had some baby pears in a jar that were preserved in unsweetened syrup. Set a bowl over a pot with simmering water and melt the chocolate. Set aside and allow to cool. Whisk the egg whites and sugar together in the bowl of an electric mixer. Set the bowl over simmering water and whisk gently until the sugar is dissolved and the egg whites are hot. Attach the bowl to the mixer and whip with the whisk on medium speed until cooled. Switch to the paddle and beat in the softened butter and continue beating until the buttercream is smooth. Fold in the cooled melted chocolate. To make the marzipan combine the almond paste and 1 cup of the icing sugar in the bowl of an electric mixer and beat with the paddle attachment on low speed until sugar is almost absorbed. Add the remaining 1 cup of sugar and mix until the mixture resembles fine crumbs. Add half the corn syrup, then continue mixing until a bit of the marzipan holds together when squeezed, adding additional corn syrup a little at a time, as necessary: the marzipan in the bowl will still appear crumbly. Transfer the marzipan to a work surface and knead until smooth. Roll one-third of the marzipan into a 6 inches long cylinder and cut into 1-inch lengths. Roll half the lengths into balls. Press the remaining cylindrical lengths (stems) into the balls (caps) to make mushrooms. Smudge with cocoa powder. Carefully unroll the genoise onto a fresh piece of parchment paper. Spread with half the chocolate buttercream and add the chopped pears. Use the parchment paper to help you roll the cake into a tight cylinder. Transfer back to the baking sheet and refrigerate for several hours. Unwrap the cake. Trim the ends on the diagonal, starting the cuts about 2 inches away from each end. Position the larger cut piece on each log about 2/3 across the top. Or if you like leave it whole as I did. Cover the log with the reserved buttercream, making sure to curve around the protruding stump. Streak the buttercream with a fork or decorating comb to resemble bark. Transfer the log to a platter and decorate with your mushrooms and whatever other decorations you’ve chosen. The buttercream was sweet and tasting it all day throughout the making of the challenge made my sweet tooth get really sticky. The following day we had guests for coffee and cake and believe me they were impressed. By the way it looked and by the way it tasted. The pear/chocolate combination is sensational. I think I would add a tiny bit more chocolate for a darker color the next time round though and maybe just a tad bit less sugar. Having said that the buttercream with the entire cake really tasted great and not as sweet as it did when I was eating the stuff by the spoonful. I was glad that the cake was enjoyed by everyone and there was not a piece leftover! Well I liked the cake. It tasted really good but I am glad I have another 12 months to make the next Yule log ;-). And then I think I would certainly go for the pear and chocolate combination again. I failed at the attempt of trying to make a genoise without ripping or cracking it. That was actually my mission with this challenge. I have made "jelly rolls" filled with cream previously and although many of my fellow DBs were having trouble with curdled buttercream, I was hoping to make a perfect genoise. No go! But practice makes perfect and I am sure I will get there - sooner or later. I was glad that I was able to cover the "scar" underneath a thick layer of buttercream. A huge thanks goes out to our gorgeous hostesses, Ivonne and Lis. You two chose a lovely challenge and I had a great time with it. To all my fellow Daring Bakers, blog friends and readers I wish you a Merry Christmas and hope you all have a great start to the New Year. I am signing off here and will be busy cooking up an awesome Christmas Eve dinner tomorrow evening for friends and family. I look forward to seeing you all again in the new year with lots of great and exciting new stuff. Or simply browse through my extensive recipe index for a few great recipes and scrumptious desserts. Yes!! I get to be the first to comment on the awesomeness that is cooking with you! I had such a great time doing this with you and in retrospect our conversation was pretty funny. Your log looks great and I bet tastes different from mine because you had the pears in syrup and you put more chocolate in the buttercream. I think I can imagine the taste of it yum! I'm making another one today, same thing. Have great Holidays gorgeous! Excellent Buche de Noel Meeta!! This was a fun challenge and my first one as a DB. Of course I tried to work it out over a couple of days and never got around to making the mushrooms...but it was alot of fun and I'm glad I did it. I hope you have a wonderful holiday season and that 2008 is everything you hope for and more!! That's a lovely log, Meeta! Season's greetings to you and your family. Looks wonderful and I am so glad you were able to share this creation. Happy holidays to you and your family my friend! Good job on your log, Meeta! The flavors sound amazing. Sorry it cracked, but there's always next time and I'm sure no one would object to another cake! Meeta, Your Yule Log looks yummylicious. I know that lots of Logs are darker but I think the clour of yours is lovely as it is. Sounds like you two had a blast! Your cake came out great. Mine?...Not so good..haha. that is gorgeous. and the pear and chocolate combo is indeed wonderful. Ohhh chocolate and pears that sounds a lovely combination. Would be fun to bake with someone too. You never fail to astound me with your creativity, your vision and your photography! I love that you baked this with Hilda ... we'll have to do that someday too! I hope you and your family have a beautiful holiday. Here's to another trip to Germany in the near future where we can finally meet. All the best in 2008, my sweet! Meeta as usual your photo's make me drool. Your Yule log looks yummy and y9ur mushrooms so real. Happy holidays to you! beautiful yule log! I love the chocolate + pear filling idea. I must try it one day. Merry Christmas to you and your loved ones, Meeta! What a wonderful flavor combination. Pears a very festive. Your log turned out great. Have a fabulous holiday with your family. WOW, yours looks incredible!! & sounds delicious!! great job on the challenge, and pears and chocolate sounds like a great combination. I hadn´t realized we could omit the coffee in the buttercream, otherwise, I might have. Oh and hilarious play by play of the chat session with Hilda. Merry Christmas to you too, Meeta! I hope you have a great time with your loved ones. i wasn't sick, but my four-year-old was... mind you, he managed to eat almost half the log all by himself when mummy was busy doing things round the house! i am keeping some for tomorrow and then, well, more indulging over the next few days! Wow, I love your mushrooms! They look so realistic. Very nice, Meeta! Happy Holidays! Great looking Yule Log. The pear and chocolate combo sounds really good. This is truly spectacular, Meeta! Want to wish you Happy Holidays. I've enjoyed reading your blog and look forward to your posts next year. Lovely log Meeta! The idea of pears and chocolate sounds great. Sounds like you and Hilda had so much fun too! Have a great, happy, Blessed Christmas. lots of love from this side of the world. it looks gorgeous meeta - and what a lovely idea to do it with someone else! happy holidays! So funny Meeta! Great write up on the baking conversation!! My Genoise cracked all over, bless that buttercream. Oh, yes that buttercream - I had a very hard time not just eating all of that, if I could have had it curdle, I'd have had to make another batch - think curdled would taste the same. Merry Merry Christmas Meeta to you and all you love. Great post..so nice you got to cook with Hilda. The combo of pears and chocolate sounds great and your yule log is beautiful! You did a lovely job on your yule log. I love the touch of pears on the filling. What a great post! You had so much fun--and got to eat a slice of that marvelous looking yule log! I'm jealous! Pears and chocolate are a match made in heaven. Happy Holidays to you and your family! Lovely pictures and wishing you n family a merry christmas and a very happy new year!! Merry Christmas to you and yours, Meeta! Oh I'm loving the pears. I was considering how to use them for this. Yours looks fantastic. Happy Hoildays. I'm impressed with anyone who can IM and bake at the same time - my skills don't extend that far unless I want to incorporate 'getting icing/sugar/flour/goo all over the computer' into a new skill. Fabulous log! Happy Christmas to you and the family dearest. looks beautiful, and making it "with" a friend sounds like great fun! 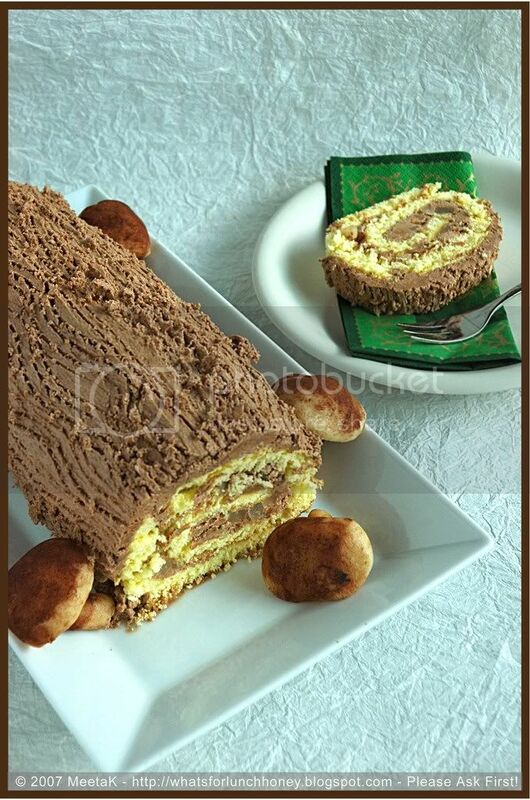 I am planning to bake a Chocolate Chesnut version of this for a New Year's dinner party. ıt will be my first time.. So excited! Yours look great, btw.. Happy Holidays! This looks wonderful. Glad you were able to "make it" with someone. this is such a gorgeous Log, Meeta. And it is so much fun to bake with somebody. I loved that the two of you did this together. What a lovely job you did with this challenge. The photos are gorgeous, as always. Merry Christmas! Hope it was magical. Pears and chocolate sound like a great combo. Very creative. Sounds like you had a great time making this one! Awww it sounds like you two had so much fun! Yay! 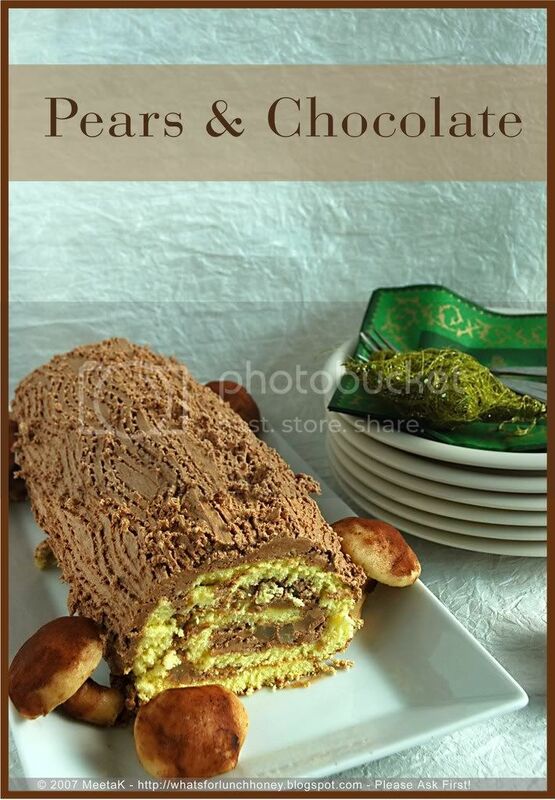 Your log is gorgeous and I love that combo of chocolate & pears! Yum! And I didn't even think of chocolate and pear! What a combination to think about and enjoy. I hope you and your family had a wonderful Christmas, filled with lots of love. You have a lovely log - and it fits on the plate. Merry Christmas and Happy New Year! my net is back and no prizes for guessing my first stop - YOu!! Who else?? And my eyes are feasting on your luscious photographs, they've gotten better and better when I've been away - hopefully my new year will start with a blogging storm! Hugs and im glad i can finally come to your blog again!!! I am loving your pear and chocolate idea. Lovely! You had me laughing with your recap of your conversation. Thats beautiful Meeta. I think I will give it a try soon :). Its so tempting. The greenish tinge looks great. oh my - your mushrooms look REAL! Congrats and happy new year. It's beautiful! I love the idea of a pear and chocolate filling. Cheers and Happy New Year 2008! Yum! Chocolate and pears sounds like a wonderful combination!! I hope you have a very Happy New Year! I can't wait to see what the new year brings! Pears and chocolate? Brilliant! I'm sure this was amazing... and such lovely photography, Meeta! I really like the texture of the frosting. And your mushrooms are perfect. Lovely yule log! I like the sound of the chocolate and pears together. And it sounds like you and Hilda had a great time making it together! Congrats on a beautiful cake! I can't thank you all enough for your great comments. Sorry I was unable to reply sooner - X-mas and New Year got in the way ;-) Now I am back and give you all a huge hug for your feedback! Pears and chocolate, yummy! 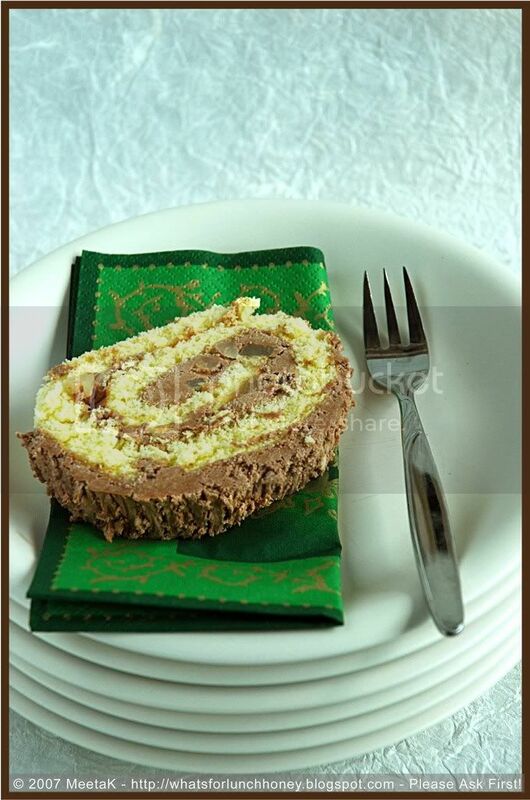 Beautiful yule log, Meeta! Chocolate and pears. Yum! And I loved eavesdropping on your conversation with Hilda. It's so much fun to bake with friends... even if it's in IM.